For the fictional wife of Meng Huo, see Lady Zhurong. Zhurong (Chinese: 祝融), also known as Chongli (Chinese: 重黎), is an important personage in Chinese mythology and Chinese folk religion. According to the Huainanzi and the philosophical texts of Mozi and his followers, Zhurong is a god of fire and of the south. The Shanhaijing gives alternative genealogies for Zhurong, including descent from both the Yan Emperor and Yellow Emperor. 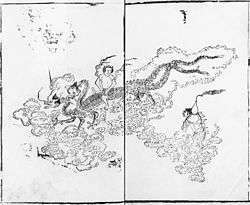 Some sources associate Zhurong with some of the principle early and ancient myths of China, such as those of Nuwa, Gong Gong and the Great Flood (Nuwa patching the sky). Chinese mythology has in the past been believed to be, at least in part, a factual recording of history. Thus, in the study of historical Chinese culture, many of the stories that have been told regarding characters and events which have been written or told of the distant past have a double tradition: one which tradition which presents a more historicised and one which presents a more mythological version. This is also true in the case of Zhurong. In Sima Qian's Records of the Grand Historian (Shi Ji), Zhurong is portrayed as a historical person, who held the governmental office of Minister of Fire. Zhurong was said to be the son of Gaoyang (also known as Zhuanxu), a sky god. (Again, the more historicised versions of the mythology portray Zhuanxu as a historical person; in this case an "Emperor of China"). Gaoyang also had a son, Gun, who fathered Yu the Great. The imperial clan of the Qin Dynasty also claimed descent through Gaoyang (though not Zhurong). Zhurong was also claimed to be an ancestor to the eight lineages of the royal families of the Chu state. One aspect of the traditional Chinese characters used in the case of Zhurong's name is that the character 融 is composed by combining the character 鬲 (lì) which refers to a ritual cauldron or tripodal vessel with three hollow legs, which is well known from archeological reports as a characteristic Late Neolithic/Early Bronze Age feature encountered in archaeological sites in northern China. This character is combined with another character, 虫; which, in the case of certain other complex characters is used productively to represent words with meanings related to worms, snakes, or insects. David Hawkes makes a case for the use of the lì radical in Zhurong's name as being significant in terms of culture and ceramic technology in relationship to the Chuci material. The Shanhaijing represents Zhurong as the son of a father whose name translates as "Play-with-Pots", who in turn is represented as the son of a father whose name translates as "Skillful Pot" (and is described as having a square top upon his head). In "General Introduction" to the Chuci anthology, Hawkes uses these observations to bolster his speculation of a significant relationship between the archeological evidence regarding ceramic technology and the cultural background of the Chuci material.